Big, rich, dark and malty, Bock lagers were originally developed to sustain fasting monks. Brewed with malted wheat, specialty malt, and molasses, this smooth-sipping, full-bodied treat will carry you through a long winter’s night. Nope. Sour, bitter, not in a good way. A wee dose of charcoal. This is ordinary at best. Not something I'd go looking for as it's too uneven in character and doesn't really have anything to recommend it. Give it a pass unless you're just looking for another notch in your beer belt. 473 mL can from the LCBO; dated Oct 27 2016 and served slightly chilled. Pours a dark, clear chestnut-copper hue, producing one finger of creamy, light beige-coloured head that dissipates completely within the next 2 minutes. A thin collar remains along with a soapy film on the surface, but with almost no lacing whatsoever. Molasses and demerara sugar sweetness characterise the aroma, with additional notes of bread crust and lightly roasted malts, which impart a vaguely chocolatey feel. Hints of toasted nuts, raisin and prune - an approachable nose, for sure. I find the flavour to be similarly easy to appreciate (though by no means is it all that interesting). More breadiness and toasted nuts, with dark fruit and moderate levels of roasted malts - enough to give this bock an almost chocolatey flavour at times. Molasses, brown sugar and toffee sweetness persist throughout the sip, but not intensely enough to make it a cloying affair - they mostly just loiter in the background, fading towards the finish, wherein some earthy hop notes help to dampen the dark malt sweetness. Light roastiness and molasses sweetness carry on into the aftertaste, soon fading thereafter. Light-medium in body, with fairly low carbonation levels that gently agitate the palate with each sip, resulting in a smooth, satisfying mouthfeel. It's a good bock that more-or-less conforms to the style, but nothing about it really stands out to me, either. Final Grade: 3.74, a serviceable B grade. 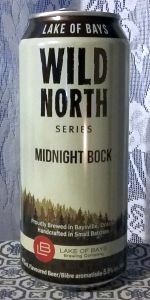 Lake of Bays' Midnight Bock is a pretty good effort, and I'd argue that it's significantly better than the other "Wild North" products I've tried (the pumpkin ale and session ale). If you're looking for something dark and malt-forward, yet also fairly light in body with good drinkability, then this is a brew that you should consider checking out. I find most bocks to be annoyingly sweet, yet this one is quite tolerable to me (despite the presence of molasses). As a BA who doesn't really seek out bocks - or enjoy them all that much, honestly - I'll still probably return to this one on a sporadic basis. Can from the lcbo for around $3. Back after a brief hiatus. 473 ml can served cold into a tulip. Purchased from the LCBO for $3 CDN. Canned October 28, 2016. Appearance - dark cola brown, with a half finger of tan head with lacing cascading down the sides. Modest retention coalescing a thin layer of wispy foam. Smell - molasses, with a light toasted aroma. Subtle hints of orchard fruits with cherries the most prevalent example. A touch of smoke and some earthiness. Taste - plenty of bitterness, a little ashy with an earthy peaty flavor too. Molasses is subdued and just a trace of butterscotch that is surpassed by all other flavours. Just needs a touch more sweetness. Mouthfeel - smooth and slick, medium to heavy bodied and a chewy feel. Carbonation is moderate but overall gives a fairly heavy feel for a 5.5% ABV. Overall - LOB's midnight bock isn't a bad example of the style, but there isn't a point of separation that makes you stand up and take notice. Certainly solid, but not terribly memorable. Would love just a little more sweetness.